The mesosphere, at heights between 85 and 100 kilometers above the Earth’s surface, contains a layer of atomic sodium. 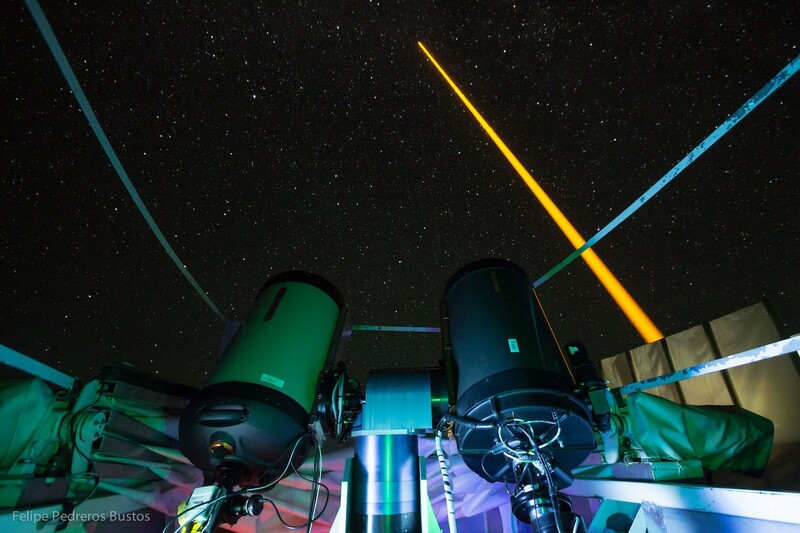 Astronomers use laser beams to create artificial stars, or laser guide stars (LGS), in this layer for improving the quality of astronomical observations. In 2011, researchers proposed that artificial guide stars could also be used to measure the Earth’s magnetic field at this altitude. An international group of scientists has recently managed to do this with a high degree of precision. The technique may also help to identify magnetic structures in the solid Earth’s lithosphere, to monitor space weather, and to measure electrical currents in the part of the atmosphere called ionosphere. Astronomers have been using lasers to generate artificial stars for the past 20 years. A laser beam is directed from the ground into the atmosphere. In the sodium layer, it strikes sodium atoms, which absorb the energy of the laser and then start to glow. „The atoms emit light in all directions. Such artificial stars are barely visible to the naked eye but can be observed with telescopes,“ explained Felipe Pedreros Bustos of Johannes Gutenberg University Mainz (JGU). In connection with the work on his doctoral thesis, the Chilean-born physicist has spent four years working on the project, which besides JGU involves the European Southern Observatory (ESO), the University of California, Berkeley and Rochester Scientific in the USA, the Italian National Institute for Astrophysics (INAF-OAR), and the University of British Columbia in Vancouver, Canada. The artificial guide stars help astronomers to correct the distortions of light that travels through the atmosphere. The light from the artificial guide star is collected on the ground by telescopes, and the information is used to adjust in real time state-of-the-art deformable mirrors, compensating the distortions and allowing astronomical objects to be imaged sharply, down to the optical resolution, the so-called diffraction limit, of the telescope. The participants in the collaborative project are using laser guide stars to measure the Earth’s magnetic field. 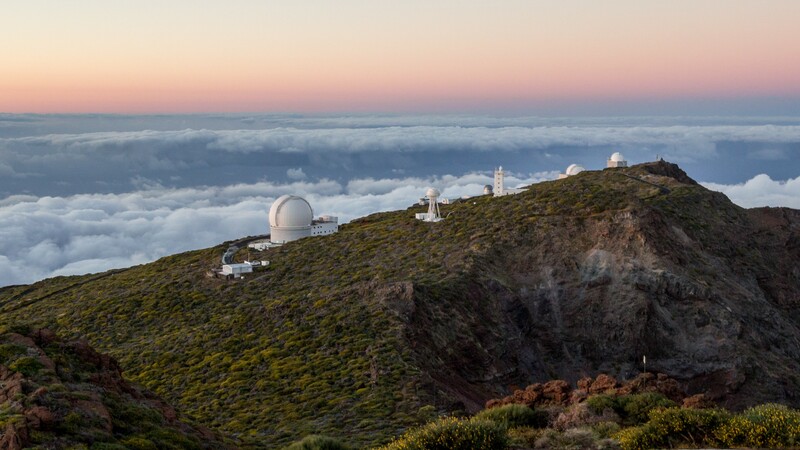 An ESO LGS unit dedicated to Research and Development is housed in the Roque de los Muchachos Observatory on La Palma, the westernmost Canary Island. The availability and use of the LGS unit has allowed to perform the reported joint experiments, which also aim at increasing the brightness of laser guide stars. From the observatory, a laser beam is directed at the sodium layer which excites and spin-polarizes the atoms making most of their atomic spin point in the same direction. Due to the effect of the surrounding magnetic field, the polarized atomic spins rotate around the direction of the magnetic field similar to the motion of a gyroscope that is tilted from the vertical, a phenomenon known as Larmor precession. „A guide star becomes brighter when the modulation frequency of our laser coincides with the precession frequency of sodium,“ explained Pedreros Bustos. „As the Larmor frequency is proportional to the strength of the magnetic field, we can use this method to measure the Earth’s magnetic field in the sodium layer.“ The detection scheme is similar to a stroboscope. Hence, the group has succeeded in using a well-studied, fundamental laboratory technique to observe the natural world. It fills a gap in our knowledge of the Earth’s magnetic field by allowing us to make ground-based observations of the mesosphere, which was previously difficult to access. Up to now, the magnetic field could only be directly measured on the ground, from airplanes, from balloons in the stratosphere, or from satellites. In May 2018, a US-American research group had published similar findings. However, these latest measurements are much more precise, and scientists hope to improve them still further by using higher-energy lasers. „We can also use the technique to estimate atomic processes in the atmosphere, for example, how often sodium collides with other atoms such as oxygen or nitrogen. This is something that hasn’t been done before,“ said Pedreros Bustos. This artificial guide star measuring technique will be particularly useful in geophysics. It will make it possible to determine changes to the magnetic field of the Earth’s ionosphere caused by solar winds. In addition, observation of oceanic currents and large-scale magnetic structures in the upper mantle would be feasible by means of continuous surveillance of the Earth’s magnetic field at altitudes of 85 to 100 kilometers. The experiment on La Palma: The laser beam (yellow) generates an artificial guide star in the mesosphere. This light is collected in the receiver telescope (front left). The laser source and the receiver telescope are eight meters away from each other. The Observatorio del Roque de los Muchachos, located on the rim of an extinct volcano at 2,400 meters altitude in the island of La Palma, provides adequate conditions to perform the experiments described.